Entity that works independently. Each luminaire has movement detectors that can activate the luminaire group. Safety, cost efficiency, energy efficiency, and easy deployment. Local pedestrians have been very pleased with the solution. Intelligent lighting at a crossroad at Viitasaari. A pedestrian crossing is a place with a high risk of accidents. Safety of this part of the road can be increased with illumination. Valopaa has developed a solution for illumination of crossroads. The installation procedure is the same as with normal luminaire installation. The solution increases the visibility of pedestrians at a crosswalk, and thus improves safety. The solution includes intelligent VP1011i street luminaires that have been equipped with iLUMNET iNODE 500 intelligent modules and as their accessory, the sensor modules. Each luminaire has a sensor that communicates with the luminaire group to activate the lighting to a higher intensity when detecting movement. The lighting intensity decreases back to the standby level automatically after a specified time after the detected movement ends. 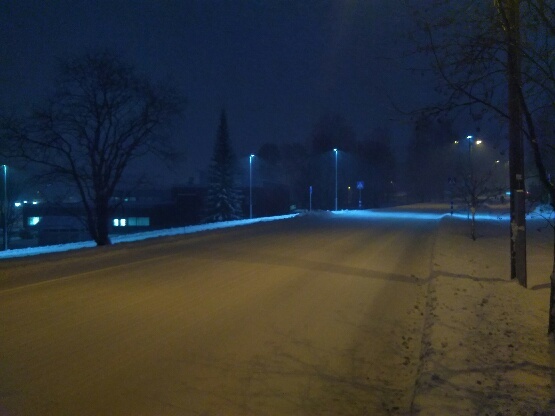 Electric contractor Tero Hämäläinen has talked to pedestrians at a crossroads site in Viitasaari and has received very positive feedback on the highlighted illumination of the intersection. Mr. Hämäläinen has been very pleased with the easy deployment that wasn’t different from any other street lighting installation. For the town of Viitasaari, this solution improves the safety of their citizens, at the same time increasing cost and energy efficiency. Preventing accidents and improving safety can be tackled with small projects.